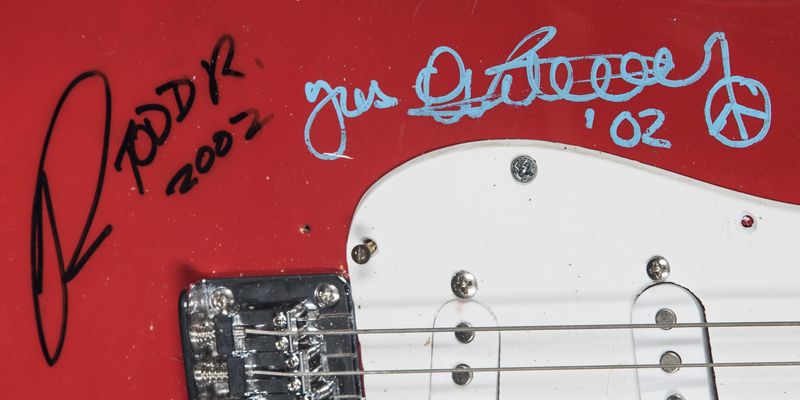 This Fender Squier Mini Stratocaster guitar has been signed by Todd Rundgren and Eric Burdon. The electric guitar is red, with a white pickguard and a natural-finish head. Rundgren has signed the body of the guitar in black marker, inscribing “2002” below his signature. Burdon’s signature has been written in blue marker. He inscribed “02” and drew a peace sign in addition to his signature. This guitar comes with a COA from Beckett Authentication Services (F63878).